Also known as Martial. Roman poet, satirist, and master of the epigram; contemporary of Apollonius of Tyana. One of the great influences on Crowley, the satyric poet. 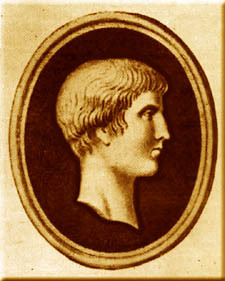 Martial was born of Celtic stock in the little Spanish town of Bilbilis, and came to Rome at the age of 26 during the reign of the emperor Domitian. He survived in Rome by attaching himself to the households of wealthy patrons, who kept him around for his wit. During his life he wrote 15 books of poems, primarily epigrams. He is responsible for perfecting the form of the epigram, a short poem whose single point is driven home only at its conclusion. The epigrams of Martial are known for their ribald, often scathing, wit. Martial never bothered with abstracts; his epigrams were based on real life as Martial saw it, and they reveal the Rome of Domitian in all its vice, folly, prudery, hypocrisy, tenderness and humor. They also provide fascinating portraits of all the diverse sorts of people who populated Rome, and the of the places where they lived and died. Martial was a remarkably non-judgmental observer who never seemed to think of how things “ought” to be. He found even the ugly aspects of his world full of interest and humor. The only subjects he seemed to find worthy of hostility were sham, pretense and trickery. Note: the Lesbia of Martial in the example below is not the Lesbia of Catullus. (Lesbia swears she was never laid for free. nec tecum possum vivere nec sine te. Non mendax stupor est nec fingitur arte dolosa. quisquis plus iusto non sapit, ille sapit. His honest senselessness is not feigned by cunning art. Vivere bis, posse priore frui. Pleas’d with the series of each happy day. The present well, and e’en the past enjoy.